One thing from doing the job you like is that you wouldn't mind doing more than what others expect from you. Well, as long as they didn't exceed your limitations, though. The resurrection of this early '80s Fuji road frame is one of the examples. We found out that the chromed surface was badly damaged that having them re-chromed will provide better result without inflating the allocated budget. Same thing happened to the paint finish, we ended up masking all the original decals and respraying the entire tubings with their original color scheme. The component pick is entirely functional: mostly consisted of the workhorse Shimano 105 combined with Tiagra brakes and Dura Ace rear derailer. Although obtained second-hand, the DT Swiss R1800 wheels are in perfect shape and performs flawlessly. If you're going to went the same path with this project this might be the small detail that you would like to know. 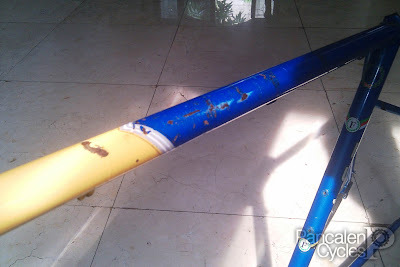 Old steel frames came with 28,6mm seattube diameter, while the front derailer band clamps/adapters available in Indonesia only came in 31,8mm and 34,9mm diameter. The solution was simple: find an aluminium headset spacer for 1 1/8" steerer, cut them in half and use them as shims for 34,9mm front derailer/adapter band clamp.